Looking for something different to do on a Friday night? Check out the Carnegie Science Center’s 21+ night! Scheduled periodically throughout the year, it’s a chance for adults to visit the Science Center after hours sans kids and experience all four floors of exhibits while enjoying an adult beverage (or two!). Each 21+ Night features a different theme. My husband Shawn and I both love bicycles so we decided to check out the June 21st bike-themed 21+ Night. This particular 21+ Night also coincided with the opening of the new Bikes: Science on Two Wheels exhibit. When we arrived we hopped on the PedalPub, a pub on wheels. It’s basically a bar in the middle with a beer barrel at one end, surrounded by a handful of stools with pedals beneath. Oh – and a driver to steer the contraption who, of course, had not been drinking. We pedaled with much effort around the Science Center’s parking lot. My only complaint was that the PedalPub definitely needed some cupholders. Things got a little sloppy on the sloped hills of the parking lot! Bikes: Science on Two Wheels exhibit, which featured a diverse collection of classic, sport, and unusual bikes from the late 1800s to the present (including one of the stunt bikes used in Pee-Wee’s Big Adventure!) It was really cool to see the evolution of the bicycle through the years to what we ride today. One of my favorites was the Schwinn Fair Lady from the 1960s. We checked out several interactive exhibits about bikes and how they work, such as the Centripetal Force Seat, the Gear Table, Hit the Brakes!, Tire Treads, and Roller Ramps. If you were brave enough you could try to ride a unicycle (neither of us were). Shawn did try his luck riding a tiny 2-foot high clown bike, which he was not so successful at — but it was certainly hilarious to watch! 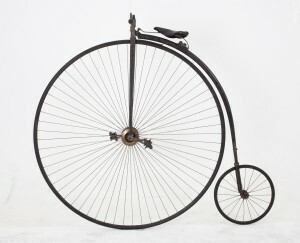 If you were daring enough you could climb on top of an adult ‘Penny-Farthing’, a bike from 1885 that had the pedals attached to a giant front wheel. Had I not been wearing a skirt, I would have loved to see what it was like to ride one of these. We learned about brazing with Maestro Frameworks in the Works Theater. Proprietor Michael Brown demonstrated the process of melting brass to join the metal pieces of a bike frame, which was pretty amazing. Bike PGH provided tips and tricks for bike repair. After we had our fill of all things bikes, we checked out some of the other museum exhibits. Shawn found out how weightlessness would feel at the 21 foot Zero Gravity wall in the SpacePlace and I challenged a robot to a game of air hockey in roboworld. (Robot 1, me 0). If you’re looking for a great way to spend an occasional Friday night doing something a little out of the ordinary, I highly recommend checking out the Carnegie Science Center’s 21+ Night. We definitely had a blast! The next 21+ Night is all about Whiskey on August 9 from 6-10. Explore the whiskey-making process with Pittsburgh’s own Wigle Whiskey. Tickets are available online for $10 if purchased by noon on the day of the event, $15 at the door. Ticket price includes access to all four floors of exhibits. There will be a cash bar and snacks available for purchase. An additional perk is $15 in free slot play at Rivers Casino for the evening. Check it out!